Sen. Marco Rubio (R-Fla.) is demanding the Army kick out the West Point graduate whose pro-communist social media posts are under investigation. In a letter to acting Army Secretary Ryan McCarthy, Rubio questioned how someone with the officer’s social media history received a commission and said the Army should immediately nullify the commission and pursue all available disciplinary options under the Uniform Code of Military Justice. “While I strongly believe academic institutions must respect the exchange of ideas and allow students to voice their opinions, members of the military who harbor anti-American views and express their desire to harm our country and its leaders are unfit to serve and defend our nation—and certainly should not enjoy the privilege of attending or graduating from an institution such as West Point, a taxpayer-funded military academy,” Rubio wrote. At issue are photos 2nd Lt. Spenser Rapone posted online last week from his May 2016 West Point graduation. In them, he is wearing a T-shirt with Argentine revolutionary Che Guevara’s face under his uniform and has “communism will win” written on the bottom of his cap. Further social media posts from Rapone surfaced calling Defense Secretary James Mattis “evil” and “vile” and saying he will “happily dance” on the grave of Sen. John McCain (R-Ariz.). Rapone is currently assigned to the 10th Mountain Division, according to the Army Times. He previously enlisted as an infantryman in 2010 and served in Afghanistan with the 1st Battalion, 75th Ranger Regiment in 2011, but was “removed for standards” from the regiment later that year. He went to West Point the next year. In his letter, Rubio said West Point should revoke Rapone’s degree and that he should have to pay back his tuition. 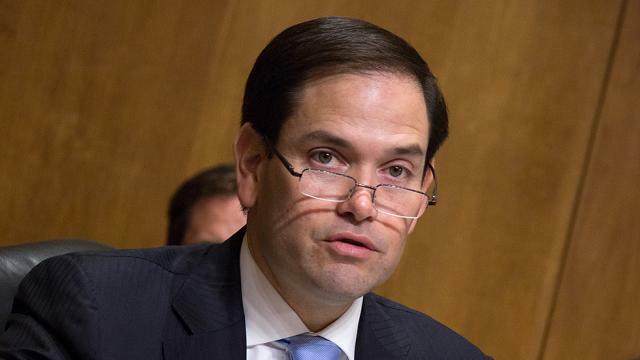 Rubio added that he assumes the incident is “an extreme embarrassment” to West Point and the Army. He also asked what West Point is doing to ensure something like this does not happen again. “The Army’s premier officer commissioning source must ensure an individual like Spenser Rapone is never given the opportunity to lead or serve beside American soldiers,” he said. I assure you all Rapone will shortly be accepted as a foreign service officer and rapidly ascent to its highest ranks. He represents all the values that State Department cherishes and nurtures. Yes, I whole-heartedly agree with Senator Rubio that Spenser Rapone should be kicked out of the Army for conduct unbecoming an officer in the US Army. How can the Army let a 2nd Lt like this lead other soldiers? He is a total disgrace to our country and to every man and women in the miltary. I am just very surprised that West Point even allowed someone with these views towards the US even to graduate let alone be commissioned an officer. Typical response from bubble-bath Rubio. Scrub out the visible imperfection and leave the puss filled leadership of West Point intact to continue infecting all they touch. This shows total lack of understanding and leadership. I am not surprised. kick the BUM out of the military and deny all associated privileges accorded military personnel????? ?